In celebration of our tenth anniversary, we at Photo Cascadia are revisiting some of our favorite posts from the vast archives of educational content that we have produced since the team’s formation. For my first contribution to this retrospective series, I have chosen to update and to expand upon one of my most popular articles, “Five Compositional Patterns Worth Finding in Nature,” which I first published on the Photo Cascadia blog in May of 2015. The article’s supplemental image links now connect to newer example photos, and two of the main example images are newer photos as well. Over the years, I have received countless appreciative comments about the original article on social media posts, through email, and in my workshops. What seems to have resonated with so many people is the article’s concise formulation of compositional options, all presented with memorable labels and schematic pictograms. I originally conceived of this approach as an antidote to more traditional methods of compositional instruction that are either too complex or else too vague to be very useful for many photographers. Although I appreciate and respect the variable and subjective nature of composition, I wanted to cut the cake a different way, providing a route into the art of composition that most photographers could utilize easily. The seminars that I teach on composition are far more comprehensive and do more justice to the value of personal sensibilities, but it has always impressed me how my slides on the five compositional patterns seem to be the ones that students reference the most after attending a seminar. What follows is a companion piece to the original article. Building off of the first set of five patterns, I am adding four more, but this time with a different focus. The first article described visual solutions that lend themselves well to composing landscape scenes in the conventional sense: scenes that feature an immersive, front-to-back visual flow and a clear visual hierarchy. I also mentioned an alternative approach to composition, which I called “patterning,” but I omitted any examples of such schemes because they fell outside the scope of that article. The four patterns below all represent alternatives to the conventional approach of composing scenic landscape photographs, and each of them amounts to more of an idea than a visual structure. They also have in common a tendency to work especially well for images of nature that are more impressionistic, conceptual, or nonrepresentational. 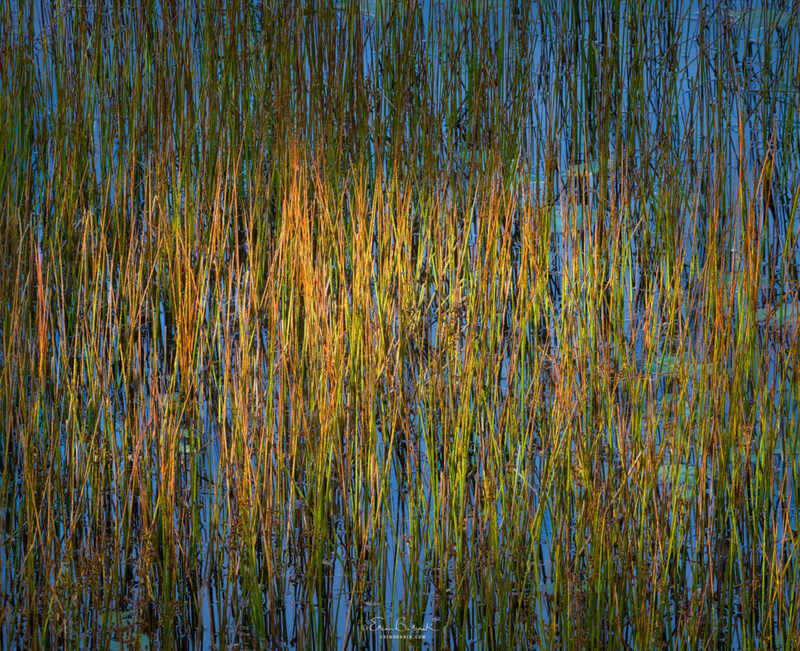 Photographers often use the terms “small scenes” and “abstracts” to label such images, but what these approaches have in common is an urge to suggest rather than to describe natural environments. Although this time I’m introducing different types of compositional solutions, they all build upon the ideas that I first set out in 2015, and there is some overlap between the schemes. Therefore, I recommend reading these two companion articles in the order that they were published. “Thick Skin” (2016). The overall sameness of a Wallpaper pattern invites the discovery of differences among the details. 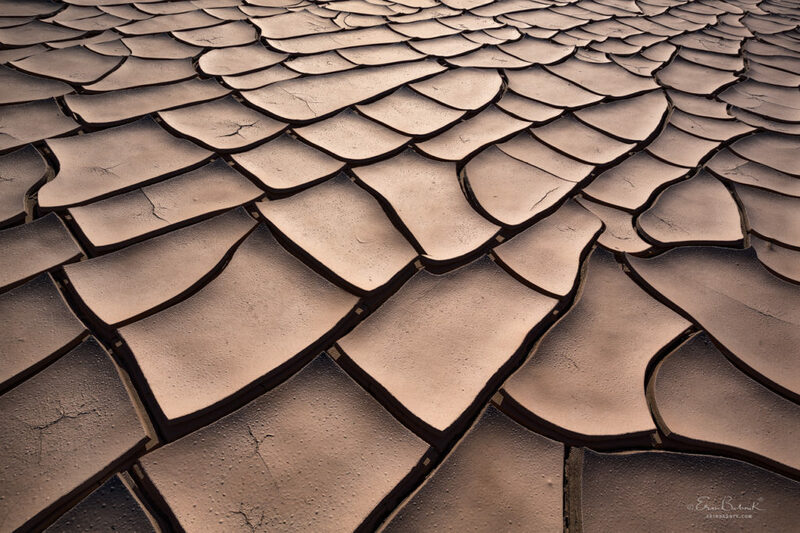 In this photograph from a desert playa, the frame is filled only with mud tiles, but variations in the tiles provide plenty of diversity. Some of the tiles bear pockmarks from rain drops, some are developing a peeling surface, some curl up at the edges, and no two have the same shape. Many people have told me that this photograph reminds them of chocolate, and I originally saw an evocation of snakeskin, making the image an example of the Simile pattern as well the Wallpaper. The first impression that a Wallpaper pattern provides is one of sameness: at first glance, the viewer sees a frame filled with repeating elements, but closer inspection allows appreciation of variations among the features. For example, a frame filled with a field of mud tiles may at first seem repetitive, but the repetition invites comparison of one tile with the next, and finding subtle differences between them all becomes a delightful game for the eye. The Wallpaper pattern tends to work best when there is nothing very anomalous in the frame to distract from the overall sense of sameness. “High Sodium” (2018). 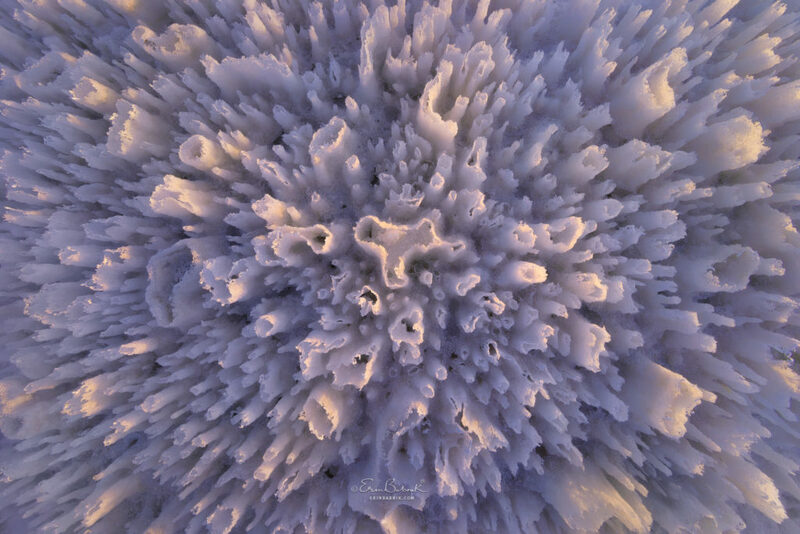 The trefoil shape at the center of this patch of salt formations is surrounded by repeating elements in a roughly concentric design, making it an example of the Mandala pattern. 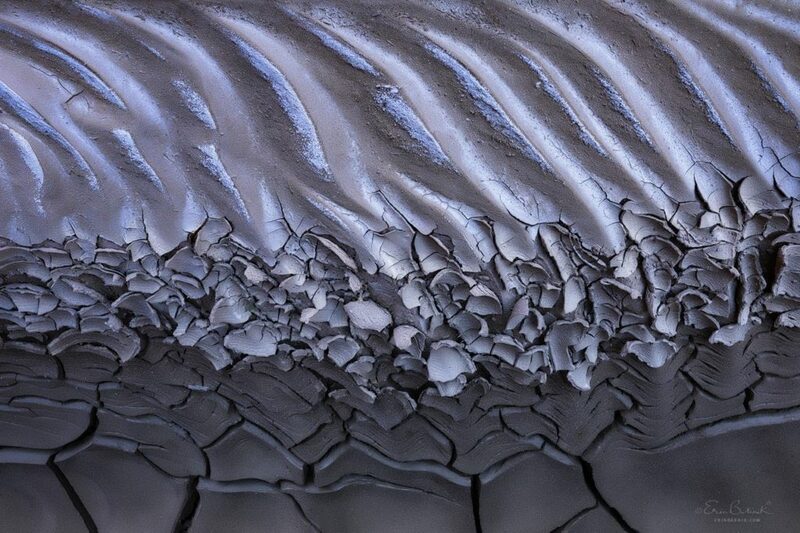 It is also representative of a Wallpaper pattern because everything in the frame is a salt formation. Lastly, the warm light of a low sun is picking out the tallest tubes, contrasting those forms against the rest of the scene that remains bathed in the cool hues of shadowed areas, so this photo could be considered an example of a Binary as well. A Mandala is a radial pattern that features a central area of interest and a high level of symmetry, often with concentric forms that provide a strong sense of repetition and balance. It is essentially a frame or zone around a central node that contrasts the ideas of repetition (the outer zone) and emphasis (the core). This contrast makes the Mandala especially expressive, inviting conceptual readings that transcend the literal presentation of whatever natural elements actually appear in the photograph. Such concepts include limitlessness, protection, a journey to a divine center, the inner self, or a source of energy, but of course possible readings are as numerous as the examples of Mandala patterns that occur in nature. “Broad Brush” (2017). This photo of dappled light playing across a pond sets up a number of contrasts: reeds versus water, lit versus unlit, and warm versus cool hues. Any one of these contrasts could constitute a Binary distinction. Also, because the lit reeds remind me of flames, I see this photo as an example of the Simile pattern as well. The Binary works on the principle of ‘this versus that,’ framing a duality of sorts, an instance of two elements or two qualities of an element that are converging or intermingling in nature. Because the Binary essentially sets up a comparison, it is more of an idea than a particular visual pattern. Examples might include foliage set against water, reflective ripples versus transparent ones, or a juxtaposition of plant species. For the Binary to be especially exciting, it helps if the two contrasting features have something in common that creates a sense of irony, allowing the viewer to appreciate the fact that the differences can appear together in the same frame. Two features with little in common (such as a foreign element placed alongside something else unnaturally) can create meaningful combinations in some cases, but such disparate pairings are often confusing for viewers. Likewise, viewers will be more apt to appreciate a Binary that excludes or minimizes any extraneous features, thereby allowing the eye to notice the essence of the comparison right away. “Rip Curl” (2016). The upper layer of dried mud in this scene has flowing and dithering forms that remind me of surf crashing on a beach. Because it evokes a subject other than what is depicted, this photo is an example of the Simile pattern. It is also a good example of the Binary pattern because it emphasizes two contrasting qualities: dry mud versus wet mud. Very often in nature it is possible to find elements that evoke other subjects when photographed, resulting in an image that suggests something other than what the photograph actually depicts. For example, overlapping layers of mud might resemble surf washing up on a beach, or a pair of blossoms might look like a heart from a certain angle. The viewer’s enjoyment of the Simile derives largely from its appeal to the imagination, providing a delightful “Aha!” moment upon noticing an idea through mere suggestion, or else from first seeing an optical illusion and then identifying the natural elements that actually appear in the photo. Each of these four approaches to composition derives its power from the principles of difference and similarity, although each one operates through its own system of visual dynamics, as described above. Consequently, it is possible for a photograph to feature more than one of these schemes at the same time—indeed, concurrences among these four are very common. Each is a “pattern” in the most general sense of that word, encapsulating a premise that is recognizable in a wide array of compelling nature photographs. My hope is that these four patterns will help readers to have a greater appreciation of nature photographs of the “small scene” or “abstract” variety, along with any impactful scenic photographs that depart from the norms of immersion or hierarchy. Above all, I hope that photographers may find some inspiration with the help of these two companion articles, a series that aims to illuminate some time-honored compositional ideas.